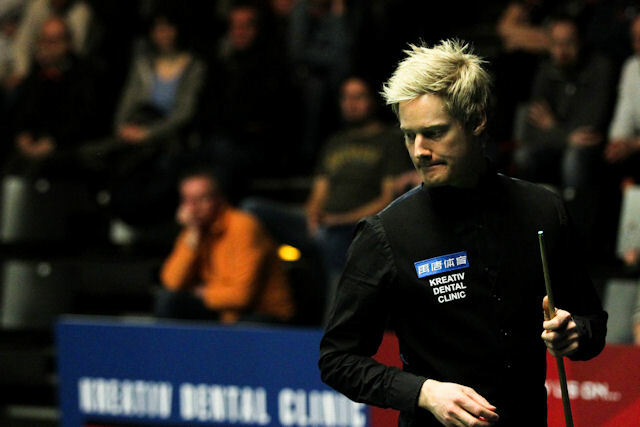 Judd Trump and Neil Robertson both sailed into the last 16 of the Kreativ Dental German Masters with 5-0 victories on Wednesday night at the Tempodrom in Berlin. Trump won the first three frames against Michael Holt with a top break of 50, then stepped up a gear with back to back centuries, 104 and 102, to win in style. “I started off slowly but I’m pleased by the way I finished the match,” said Trump, who now meets Martin Gould. “I haven’t played many tournaments lately so I struggled to start with, but then I got going. At the start today I wasn’t sure how I would play, but tomorrow I’ll have more confidence I think I’ll improve as the tournament goes on. World number two Robertson top scored with 84 in a comfortable win over Fergal O’Brien. “Fergal’s a good all round player and there will always be a few tactical exchanges against him, so I’m pleased with the way I played,” said Australia’s Robertson, who was beaten 10-2 by Shaun Murphy in the Masters final last month. “I was playing in the Chinese pool tournament so I haven’t prepared that well for this event, although I was playing a lot of competitive matches. “I haven’t done well in this tournament apart from getting to the semi-finals in 2013. It’s such a great arena so I’d love to be here towards the end and feel a part of that. Stephen Maguire survived a fight-back from David Gilbert to win 5-3. Breaks of 77 and 53 helped Maguire build a 4-0 lead before Gilbert recovered to 4-3. But Maguire finished strongly with an 80 in frame eight. World number five Barry Hawkins suffered a 5-3 defeat against Mark King, whose top break was 106. China’s Xiao Guodong came from 4-3 down to beat Liam Highfield 5-4. Highfield led 47-0 in frame eight and 50-0 in frame nine but couldn’t finish the job.